I am an artist…. Right? The question of whether one thought of him/herself as an artist was asked of every art major completing their senior thesis. At least that is what happened the year I was a senior. All of the seniors sat in a circle with the professors interspersed so it was more of a round table discussion instead of a drilling session. The professors wanted us to feel more like their equals as they asked questions about our senior theses : artist to artist. When it was my turn to answer that question I remember my reply gave everyone pause. If I was not the first one to answer I knew I had to be second. How unsure I was of the statement that I was an artist came out. 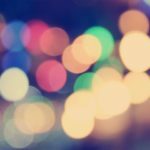 Did receiving a college degree truly make me an artist? Was someone without a degree therefore not an artist? After all the art history classes I knew what art was. That there was a difference between high art (legitimate art) and hobby or craft art. So I begged the question if what made me an artist. No one n n had a real answer fir me, neither teacher nor student. The moment of contemplation past when another student boldly proclaimed that she was indeed an artist but she never backed up how she knew. At that time I wasn’t sure that I really was an artist I mean at least not an artist like Michelangelo or Leonardo da Vinci. I might have felt like an artist but not one of that caliber. Since graduating, I have not gone on to make and sell lots of pieces of artwork. The bulk of my productivity has been that of a crafter, a hobbyist, or a mixed media/textile artist. Ten years ago none of that was considered to be on par with painting or sculpting. I was not a consistent creator of high end art. I have been a seamstress and an artist with thread. Even for my senior thesis I created mixed media art. My entire senior thesis was based on painting clouds on fabric that I then turned into quilts utilizing both hand sewing and machine sewing techniques. The title of my senior art show was cumulus. Ten plus years later I still don’t think I am a da Vinci or a Michelangelo but I am an artist. I say all this to then come back to the present. This morning as I was trying to do some finishing touches on the underside of a bunk board for one of my nephews. I had shown both my nephews several types of clouds that I painted in the past that are displayed in paintings and quilts around my house. Then I showed them a picture of some Toy Story clouds someone painted for their child, never once referencing the movie. I wanted them to tell which type of clouds they wanted painted on the bunk board. And what would you think they picked? Yep you’re right they picked the Toy Story clouds. 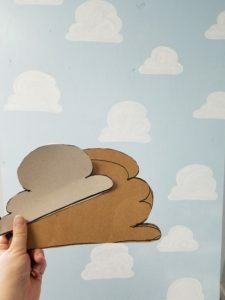 And so I sat there wondering as I was making a stencil, to then make “perfect” Toy Story clouds, what would da Vinci or Michelangelo be thinking to themselves if they were asked to do something similar for a child that they loved? Would they be muttering to themselves “I painted the Mona Lisa” or “I painted the Sistine Chapel” and “but now I am reduced to stenciled clouds”. That train of thought made me smile. Yes, I have an art degree (actually art/art history and business) and I have been reduced to making a cloud stencil to paint perfect clouds on a bunk board. That is my life and I’m happy with that. I could have a kind of a weird outlook on it and be very upset but I’m not. Truth is the kids see my clouds that I paint displayed all around the house. The kids don’t need more of my clouds. They need their own. I still enjoyed thinking back to that discussion, remembering how my insecurities of that time left even the professors in silence, and having a good chuckle over how I was at that moment painting stenciled clouds. Sometime last year Rent-a-Dad and I had a small get-together at our house for one of our nephews. During that time a friend was walking around our small living room looking at all of the artwork on display. She pulled me over to ask me about a few pieces not knowing that I was the artist or that art was my major in college. In college I had majored in Art with minors in Art History and Business. As a college student I had this BIG lofty idea that I would get my master’s degree in museum studies and go on to either work with a museum, a private gallery, or in the acquisitions department (artwork as assets) for a major corporation. During my college career I had art shown in multiple venues including three pieces on display at the local art museum. I was even lucky enough to sell quite a bit of my art and chose what I wanted to keep for myself. Post college… Well that was a different story. 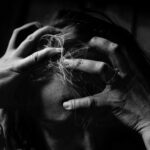 Life took a few turns I hadn’t expected (as it does) and I did not go on to pursue my master’s degree right away. 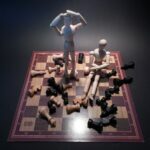 I had an website and an online store for a while but it became more difficult to keep up with then I felt was worth it. I did put my knowledge and degree to work in many other ways and went on to be certified in Non-Profits Management. One day, if the mood should strike me, I do plan on getting my master’s degree… we will just have to wait and see in what field. As for creating art post college, I was a member of The Art League in Alexandria, VA for two or three years. I almost had pieces in shows multiple times but ALMOST is not something a person can base a career on nor did I really have the time to fully apply myself. The adjudicators gave great critiques and the one that came up the most was “feel the artist has potential if she only took her time”. With the challenges life has thrown my way, I have not had a studio where I could be both as messy I want or as clean as I want nor have I had the time to be the artist I want to be. That doesn’t mean I have stopped creating. It just means what I create is meant to make me happy and others happy. The project below is based on a piece of artwork I made in college in a textiles class. 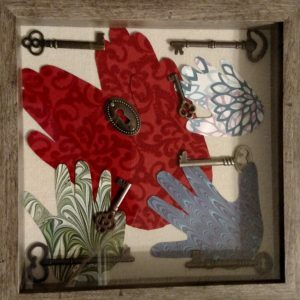 My friend had asked if I knew how to create something like it as she loved the idea of hearts, locks and keys. 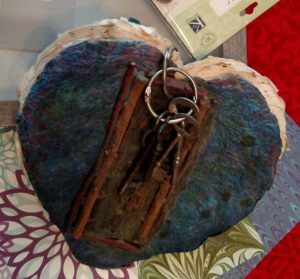 The original piece (titled: closed heart) was created using paper I had made from tree pulp and dyed in the textile class, pieces of a rose bush, an antique lock and antique keys that I had acquired. The piece of artwork had to fit a graded theme: a book project. So I created a heart shaped “journal” that was permanently sealed with a broken lock and a variety of keys that the viewer could imagine might have fit the lock. My statement about the piece was that our hearts can become guarded and “locked” when love has gone wrong and a relationship ended badly. I knew that was not what my friend wanted her piece to be about. I wanted the piece I created for her to be about her children and how they have the keys to her heart. I made this piece, with the help of her kids, as a Mother’s Day present. Something similar could easily be made for Father’s Day as the subject matter is something most dad’s can relate to as well. 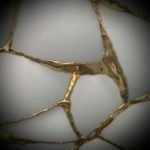 When creating a piece of art or a craft for someone that is going to reflect a moment in time, it is always good to know the likes and wants of the person you are making the piece for. 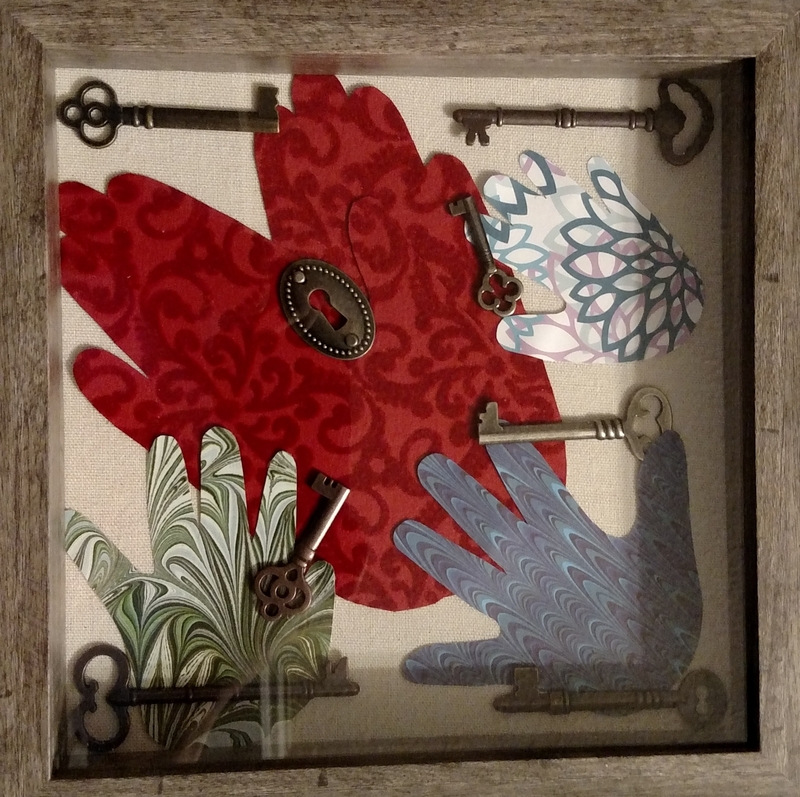 In this case my friend loved the idea of hearts, keys and locks. Think your piece of art (or craft) through from start to finish before you jump into the project. I tend to sketch out my ideas and create a supplies list that way I know if the project is even possible with what I have or do I need to go shopping. 1- Sketch out your idea. Here I decided I wanted to create a heart from the cutouts my friends hands and then a hand cutout for each of her children. I wanted to put a lock on her hand cutout “heart”, and for each of the kids to have a key in/on their hand cutout. 2- At the craft store I selected paper to represent the heart (flocked red), and a different piece for each of the children. I selected blue for the eldest, green for the middle child and something floral for the baby, which are all colors that have been used to represent her children in past projects. 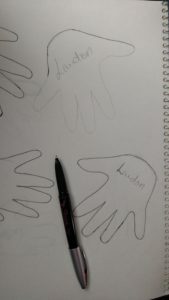 3- Trace the hands you want to use. I then inked over the tracing and photo copied the tracings so I kept the original tracings pristine in case I made a mistake cutting out the hands. 4- Cut out the photocopied hand outlines and lay them on the backing of the shadow box to make sure you know how you want the hands to be positioned. I played with the ones signifying a heart until I was happy with the shape. If you think you won’t remember take a picture of the layout to help you when you have all the pieces ready to be glued down. 5- Lay the hand cutouts on top of the paper you are associating with that hand outline and trace with a pencil. 6- Cut out the hand outline. Erase any remaining pencil marks that stand out. 7- Lay the hand outline on the backing of the shadow box. When you are happy with the layout begin to use the glue dots to glue down the paper. Personally I liked using the scrapbooking dots for any paper that overlapped (such as the heart) but then liked using the regular glue dots to secure the paper to shadow box backing. 8- The antiqued locks I used for this project came from the scrapbooking department so they came with paper tacks. I debated using the pushpins to secure down the lock but in the end opted to use the pushpins to create a whole in the board where I could push the paper tacks through. I also put glue dots on the back of the lock to help hold it in place. 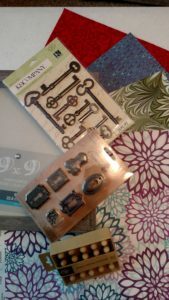 9- The antiqued keys I used came from the scrapbooking department as well. They already had a glue backing applied to them so all I had to do was remove the paper backing thus exposing the glue and placing the keys where I wanted them to be on the artwork. 10- Finally I re-assembled the shadow box. Your moment in time project is complete! Not everyone likes to decorate their homes for the smaller holidays but our family is always a little but sad once Christmas is over because it means the house going back to “normal”. If you are like us, here are a few crafty ideas that can turn recycling items into decorations to brighten up your home and bring back special memories! If you were to walk into my house and turn to your right you would notice that I have a watercolor lithograph of my favorite watch dog. If you look closer you may also see four nails that are the same color as my walls. These empty nails are for my seasonal art and crafts. At Halloween I have some woodcut outs I purchased at craft fairs over the years, at Christmas I have a stocking and Santa face sculpture that hang on the wall, and so on. 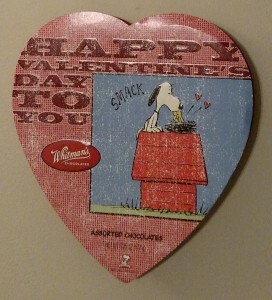 For Valentine’s Day I have several empty chocolate boxes that I hang in this prominent area. 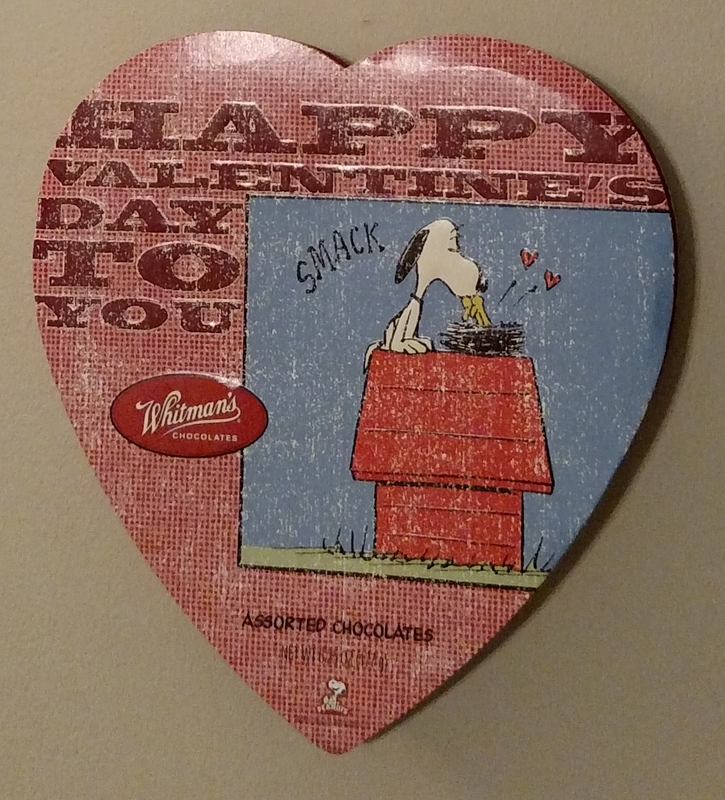 They are my husband’s favorite chocolate boxes from memorable Valentine days we have shared and they sport the image of one of his beloved child hood mascots: Snoopy. Now that our nephews are getting older, Snoopy happens to also be one of their favorite recognizable characters too. I can’t imagine not hanging these boxes for them to see. It brings a smile to my face. 1) Using a found item, like an empty candy box with a vibrant image, is a good way to celebrate a holiday as well as memories and it can be an inexpensive way to decorate. 2) Say you have an empty candy box and you don’t like the image… well decorate it any way you want. The empty candy box provides a nice structure to build your artwork on top of like a pre-existing frame. One Valentine’s Day my mom bought me a candy box half my size and she wanted me to turn it into a piece of art when we were done eating all of the chocolates (a few months later). The front of the box had this large image of a rose on it. Just your ordinary basic Valentine box. I tossed the front lid but held onto the back lid as a frame. I then took red and pink tissue paper and crumpled sheets into smaller roses. I filled the entire box with the tissue paper roses and one by one I used craft glue to secure them into the box. At times I found the craft glue annoying with its runny stickiness and thought of using hot glue but couldn’t find my glue gun. After letting the glue dry for 48 hours, I then hung the tissue paper filled box in the window. On the inside of the room we saw a red heart and outside of the house we saw the roses. This has been one of my mom’s favorite decorations in recent years. 3) For this idea you can choose to use the shell of a candy box or an inexpensive frame (from craft store or better yet the thrift store!). 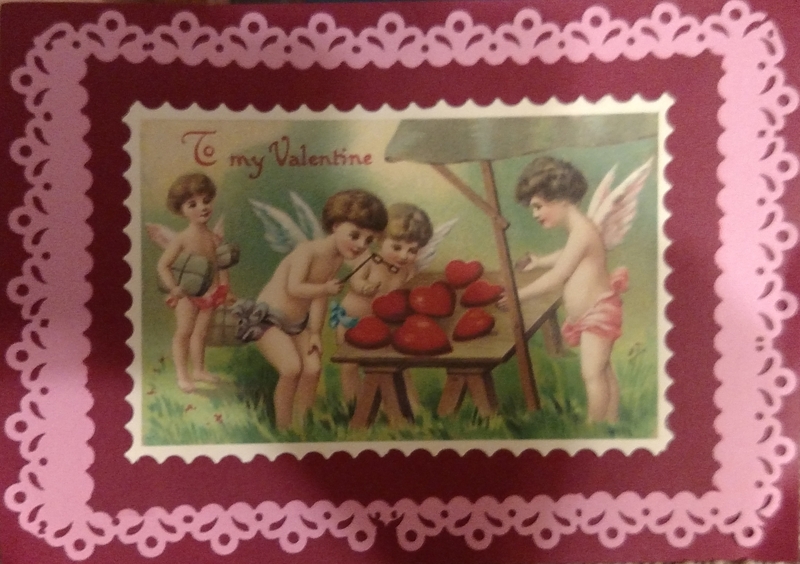 Not only has my mom held onto old Valentine cards over the years, I love looking through antique Valentines when ever I get the chance to explore antique shops. This is a fun way to display those precious images. You can either cut them to fit inside the heart shaped candy box and glue them down or you can frame the cards in your craft/thrift store frame find. I took several outdated frames and gave them an antiqued look with craft paint and framed some old cards for our guest bedroom. When I was a kid my mom would buy craft paper, paper doilies, stickers and glue sticks. Then we would sit down and design Valentine Cards and art to decorate the house. Because it was paper crafts before there was acid free paper our art work would last one or two seasons before falling apart completely. Here is a project that should last more then a few years. My current banner has been around for four or five years and is still in good condition. 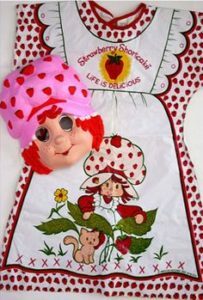 When it isn’t displayed on our mantel, I store it in a zip-lock bag when I am not using it. The banner I made for my mom is much shorter then ours as she hangs it from the hook on her family room door. Her banner is also still in good condition. 1- First ask yourself if you want the banner to have a theme. 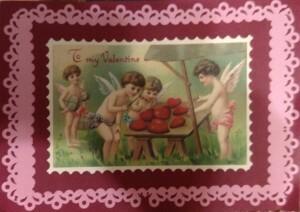 Ex: I had all these antique Valentine Cards but their subject matter was from puppy dog love to Victorian images. I decided I wanted my banner to only have Victorian images on it. The color in the images was various shades of pink. So I decided that the scrap book pages I would use would be shades of pink as would the ribbon I purchased. 2- Lay out the cards you want to use and decide what order you want them attached to the ribbon. 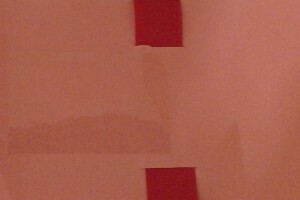 Then decide what size you want the crap paper to be and if you want more then one layer of craft paper. 3- I decided to use three layers of scrap booking paper. I first measured and cut the each layer of paper to the size I wanted. I used scrap booking scissors to add an interesting design to the edges of a few layers. 4- On the back piece of paper I cut slits for the ribbon to slide through then slid the ribbon through all of the back pieces. Once I had the back layer arranged where I wanted on the ribbon I used glue dots to secure the ribbon onto the back parts of the cards. 5- Then I attached all the other layers of scrap booking paper and card using permanent scrap booking tape that is acid free. 6- Because I normally attach the banner directly to my mantle I put a two inch piece of packing tape on the back of each finished card. This allows me to use tape or tacky putty to hang the banner on my mantle without ruining the paper on the cards. 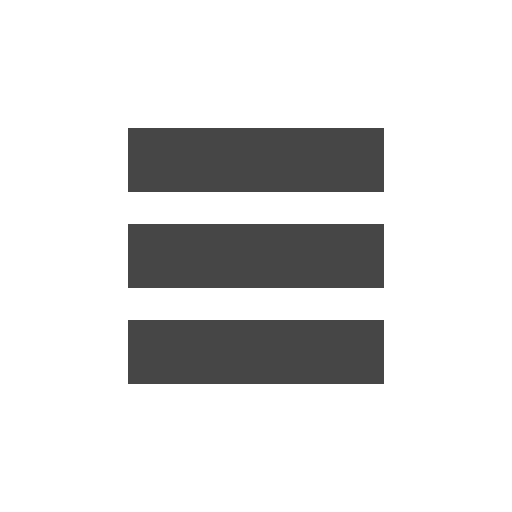 I know I have been promising something crafty and fun for our blog and Facebook readers that I myself have created. 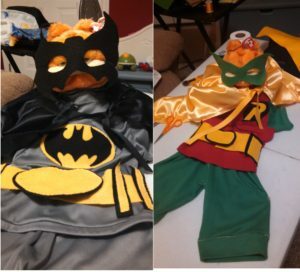 Recently I shared a post from another site about how to re-purpose out of date or unused cribs because I love the idea of taking something old and beat up and turning it into something function-able and fashionable. Below is a personalized wall art project that I made for my nephews a few years back. In the next couple of weeks I hope to share a few other fun craft projects that I loved making with my family. Most people love to see their initials or name displayed somewhere in their house such as towels, bookends, checkbook covers and more. Children really are no different. When I was little, my mom bought five 2” wooden letters that spelled out the unique version of my nickname. I still have those letters displayed on my dresser to this day. When my nephews were getting ready for their new home I thought I would do something fun for them with their initials. 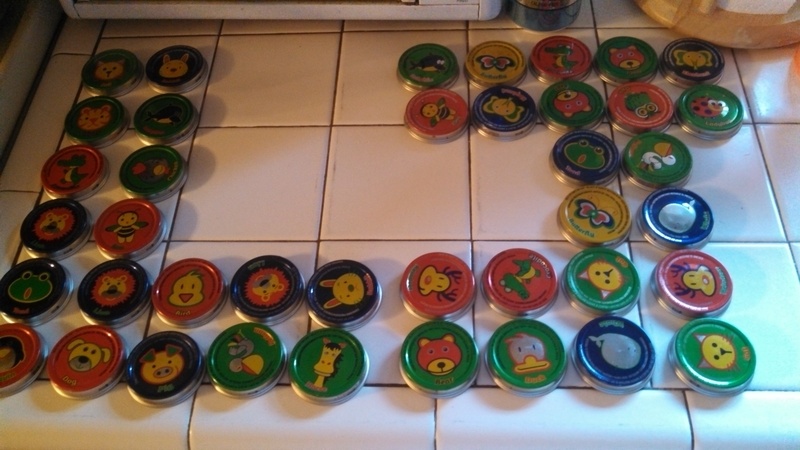 At the time Gerber helped me determine what that fun project would be as they had colorful animal designs on the lids of their glass jars. Since one of my nephews was an infant at the time it just made perfect sense. 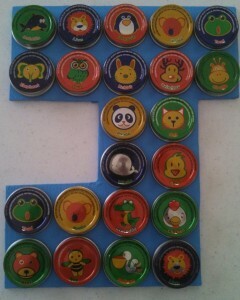 The boys loved looking at the animals on the lids and each had their favorite animals. So I collected and saved the lids to make something personal and fun for their room. An added bonus was that the finished project was also tactile and the boys had fun pushing the caps in to hear the caps make a clicking noise. 1- If you are cutting the letter out of luan, in pencil draw the letter onto the luan before you cut. Since you are using pencil you can always re-draw the letter if you do not like your first attempt. Printing a design out to lay onto the wood and trace also works well. 2- Sand any sharp edges of the letter before painting. If the letter is already painted but you wish to change the color, gently sand the letter so the paint will better adhere to the surface. 3- Paint the letter and let dry. May or may not need a second coat depending on the desired color. 4- Once dry, lay out the decorations you have found or purchased onto the letter. Play with the arrangement until you are happy with the orientation. 5- Take a picture of the layout so you can refer back to the photo as you begin to glue down the decorations. 6- I used wood glue to adhere the gerber caps to the letter in the pattern I like but you can use epoxy instead of the wood glue. Either way, make sure you use a glue that will hold up to rough play. Even though the kids should never play with the letter toys (like balls) do have a tendency of getting tossed around and hitting walls. 7- Let the decorations dry on the letter for at least 24 hours (or as the glue directions advice) before you hang the letter. If the letter was purchased from a craft store then you can most likely just hang it based on what is attached to the shape. While you can choose to just drill a hole through the letter to hang on nail, a better solution exists through a simple purchase of a OOK ReadyNail Picture Hanging Kit from a craft store. The kit I recommend comes with both a sawtooth and d-ring nailing hangers that are specifically designed for artwork without pre-attached hardware. The kit also includes hooks with nails and wire coil.